The development is currently paused, due to time constraints. It is not recommended to use this tool in production. Hi! Apparently you're using an old browser which is not supported by simulator.io anymore. Please update your browser or use a different one. Build and simulate logic circuits. 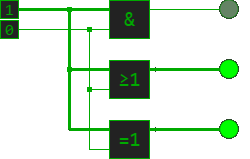 Web-based logic circuit simulator for people who want to build a computer from scratch. 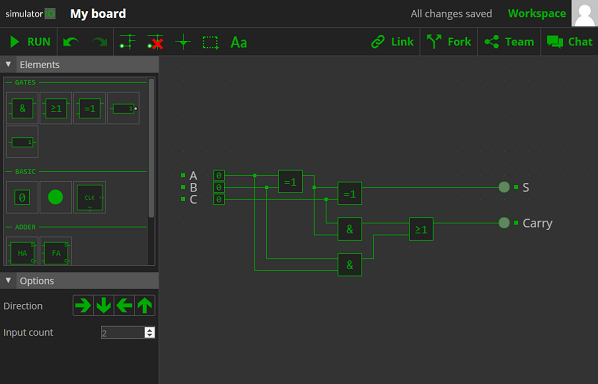 simulator.io is an online CAD tool for logic circuits. Easiest way to learn how to build logic circuits. Select an element. Place it on the board. Use the Wire Tool to connect your elements. Click RUN to start the simulation. Collaborate with your team in real-time or share a snapshot of your work. from a simple light switch to a complex CPU. Or create an anonymous board. Only the board owner can change the team member settings. You can share a snapshot of the current board which is represented by a unique URL. Snapshots are editable, but can only get saved as new snapshot or as fork. Everyone with the permalink to the snapshot can access it. You can create a copy of this board in your workspace. You will be the owner of the board and can set up your own team of collaborators. Changes in the new board will not affect the forked one. We are sorry, an unexpected error occurred. Please reload the page. If this error still occurs, contact the support.